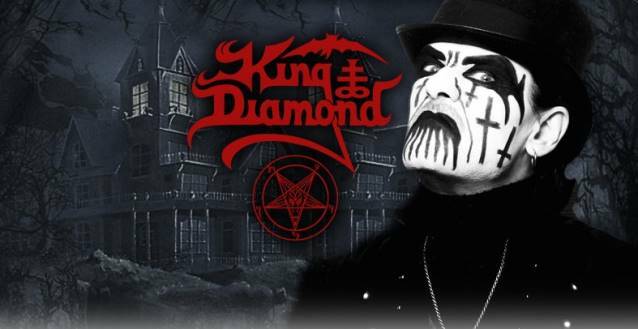 KING DIAMOND's video for the song "Give Me Your Soul" can be viewed below. The band's first clip in 17 years was shot in September 2007 with director Bill Schacht from video company Aestheticom, which had previously worked with DIO, ALICE COOPER and DREAM THEATER, among other artists. Speaking to MTV.com, the group's frontman/namesake — who was suffering from a herniated disc at the time — said about the video shoot, "They limited what I had to do, of course, so I only did one day of shooting for 90 minutes, but just standing there moving a little bit in the full outfit was very difficult. And afterwards, I got one of those sharp attacks of pain that I hadn't had in a month and a half. The only thing I can compare it to is a really super-bad toothache or earache. And afterwards, I was like, 'OK, I'm not ready [to tour] yet.' "